The mystery of dinosaurs captures each new generation of children and awakens their intrigue and interest with these pre-historic beasts. I love that we’ve never seen one, but 4 year olds know exactly what a stegosaurus or triceratops looks like. My 4 year old has a favourite green dinosaur that he loves using in his imaginative play. He stomps around the house talking in a gruff dinosaur voice and this love inspired his 4th birthday being a dinosaur themed one. My dinosaur party secret weapon is that Kmart have 200 piece dinosaur play sets for $15. Buying one of these will provide you with all the inspiration you need for creating a great pre-historic dinosaur theme. It’s so comprehensive with trees, bushes and dinosaurs that you can use them to set the table and scatter around the house for a great pre-historic scene set up. Having cut out dinosaur feet to decorate is a great and easy craft activity for kids. You could decorate them and then stick them on the back of their chairs while eating, or play ‘musical feet’ with them. Use a chocolate spider recipe to create ‘dinosaur nests’ in cupcake cases and pop an Easter egg/ jelly bean on top as the dinosaur egg. A fruit platter with a sign ‘Herbivores Only’ will make those delicious and healthy fruits disappear as your guests gobble them up. Shape cut biscuits decorated with green icing and chocolate chips as scales also will look fantastic. One of my favourite dinosaur birthday party games is to set up an excavation site in the backyard for the kids to dig for dinosaur bones. Those clam shell sand pits are a perfect size, especially if they’re already full of sand. You can use the mini dinosaurs from Kmart and bury them in the sand pit for your little archaeologists to find. Give them disposable forks, spoons and some paint brushes to dig and clean up their discoveries. If space does not allow for a sandpit set up, you could cook some play dough, colour it green and stick a dinosaur inside each one for the kids to find. We did a dinosaur cake for my sons 4th birthday which looked great – green icing over its body with spearmint leaves as scales. Tasted delish too! There are heaps of dinosaur candles you could also use to compliment your dinosaur cake. Lots of people choose to go for themed cupcakes instead of cake, so do a google search for some inspiration. So that no one gets forgotten, it’s a good idea to write children’s names on the party bags, so get creative and write T-Rex Tommy, Brontosaurus Ben and Stegosaurus Sienna to make it more fun. 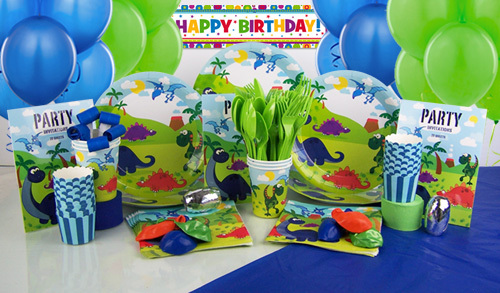 Since you’ve already got the camera out for the party, get all the guests to gather around the birthday child and give their best dinosaur impression. You might like to email a copy of the photo to each guest with a thank you note for coming to the party.